Mary Beth Walker has been named CSUN’s new provost and vice president of academic affairs. Photo courtesy of Mary Beth Walker. California State University, Northridge President Dianne F. Harrison today announced the appointment of Mary Beth Walker, interim president at Georgia Gwinnett College and associate provost for strategic initiatives and innovation at Georgia State University, as CSUN’s provost and vice president for academic affairs beginning July 1. 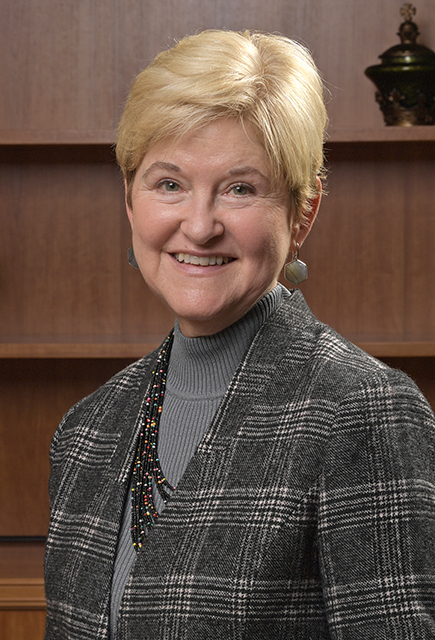 Walker brings more than three decades worth of experience in higher education, including as a dean and department chair, in addition to her research and scholarship as a respected economist. Walker said she is looking forward to joining the CSUN community. She replaces Stella Theodoulou, former dean of CSUN’s College of Social and Behavioral Sciences, who has been serving as interim provost and vice president for academic affairs. Walker has a bachelor’s degree in economics and mathematics from Rhodes College in Tennessee and a master’s and doctorate in economics from Rice University. As an economist, her research interests center on quantitative evaluation of policy, including tax policy and some labor market issues. In recent years, she has focused her research efforts on education economics. Walker began her career as a professor of economics at Emory University in 1986 before joining the faculty of Georgia State University in 1991. In 2008, she became associate dean of the university’s Andrew Young School of Policy Studies on an interim basis. In 2009, Walker was named chair of Georgia State University’s Department of Economics before becoming dean of the Andrew Young School of Policy Studies. While dean, she worked to enlarge the school’s academic disciplines and research centers, including the creation of its Urban Studies Institute. In 2017, Walker was named associate provost for strategic initiatives and innovation at Georgia State University. In her new position, she had broad responsibilities across the university to help create and implement new strategic initiatives. Among those was the Next Generation faculty hiring initiative, which funds faculty-proposed efforts for cluster hires to accelerate interdisciplinary research and create new academic programming. In January 2019, Walker was named interim president of Georgia Gwinnett College while a search was conducted to fill the post permanently. The college serves about 12,500 students, with nearly 500 full-time faculty. It offers baccalaureate degrees in 17 different majors, with multiple concentrations. The students are ethnically, racially and economically diverse. Many are first-generation college students. One of the largest universities in the country, CSUN is an urban, comprehensive university that delivers award-winning undergraduate and graduate programs to nearly 40,000 students annually and counts more than 360,000 alumni who fuel the region’s economy. Since its founding in 1958, CSUN has made a significant and long-term economic impact on California, generating nearly $1.9 billion in economic impact and nearly 12,000 jobs each year. The Association of Public and Land-grant Universities named CSUN an Innovation and Economic Prosperity University for university-wide efforts to promote innovation and entrepreneurship, fostering regional development through public service, engagement and outreach. CSUN’s faculty include internationally recognized scholars and researchers — they include winners of Guggenheim fellowships and Fulbright awards. Recognizing CSUN’s leadership in fostering diversity, CollegeNET named CSUN a Social Mobility Innovator for its transformative effect on students and the region, and the Wall Street Journal ranked CSUN second in the nation for the university’s diverse learning environment. Serving more students on Pell Grants than any other public university in California, CSUN is a true social elevator, where individuals rise, lifting greater Los Angeles and beyond.